The Jerusalem Chords Bridge (Hebrewï¿½, Gesher HaMeitarim), is a cantilever spar cable-stayed bridge at the entrance to Jerusalem, Israel. When the Red Line of the Jerusalem Light Rail begins service on April 7, 2011, the bridge will be used by trams running from outlying Jerusalem neighborhoods to the center of the city. Incorporated in the structure is a glass-sided pedestrian bridge enabling pedestrians to cross from Kiryat Moshe to the Jerusalem Central Bus Station. ■ Museums - Complete Jerusalem museums travel guide provides all museums listing in Jerusalem. ■ Religious Sites - Jerusalem is the location of a number of specific places sacred to one or more of the three monotheistic religions, Judaism, Christianity, and Islam. Designed by the Spanish and engineer Santiago Calatrava, its construction began in 2005 at a cost of NIS 220 million to the Jerusalem municipality and Israeli government, totaling over twice the original planned expenditure. The bridge was inaugurated on June 25, 2008 in honor of Israel's 60th anniversary. A pedestrian bridge designed by Calatrava in Petah Tikva, Israel, though much smaller in size, also uses a single mast and cables. The bridge was designed to add a defining visual element to the Jerusalem "skyline" at the entrance to the city, and to carry a light rail system that will solve some of the city's traffic problems. Similar to Calatrava's earlier (1992) design, the Puente del Alamillo in Seville, Spain, the bridge makes use of an angled cantilever tower to absorb some of the load and reduce the number of cable stays needed. The bridge consists of a single pylon counterbalancing a 160 metre span with lengths of cables, making a dramatic architectural statement. While this is Calatrava's 40th bridge, it is the first he has designed to carry both train and pedestrian traffic. A striking feature of the bridge is a single 119-metre high mast supported by 66 steel cables constituting the tallest structure in Jerusalem The bridge has become a tourist attraction but is not yet operative, with the light rail project several years behind schedule. 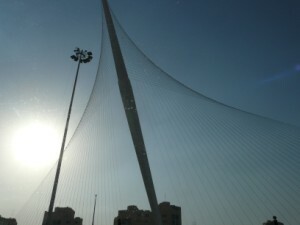 According to former Jerusalem mayor Uri Lupolianski, who was instrumental in getting the project off the ground, the bridge symbolizes David's harp. Others interpret the looming pylon as the bust of a long-necked bird, a human arm or an arrow caught in a bow. The project has been criticized as an extravagant and costly solution to a problem that could have been solved by cheaper means. The aesthetics of the bridge and its impact on Jerusalem has also sparked controversy. Some say the bridge, situated at the city's crowded entrance, does not have enough space around it for people to appreciate its artistic merit Many feel that the bridge is simply out of its element and question whether it fits visually in the city.